Soju Shots: Perhaps the most notable icon in "Hangover" is the little green bottle Koreans call soju. This rice-based distilled beverage is about 20% alcohol, is ridiculously cheap (about $1USD/ bottle) and is available on just about every block of the peninsula, making it the top choice of those eager to get black-out drunk. Koreans drink so much of it, in fact, that Jinro Soju is the best-selling spirit in the ENTIRE world. And you thought Russia was the town drunk. Drinking Dominoes: Poktanju, literally "bomb alcohol", is a shot of soju or whisky that is dropped into a glass of beer. 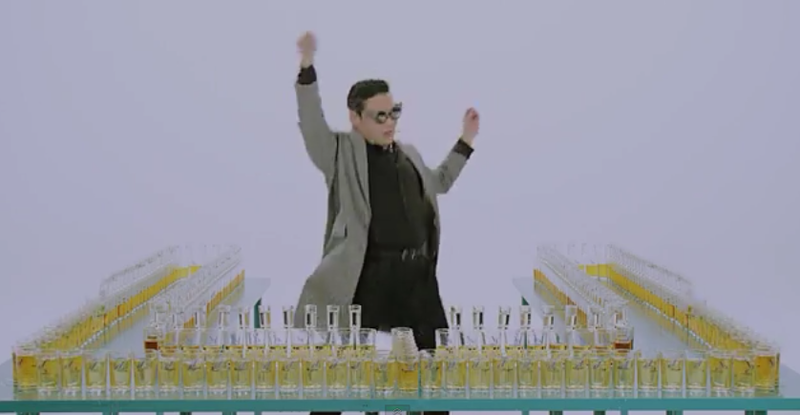 In the video, Psy concocts these shots by playing the ultimate game of drinking dominoes. 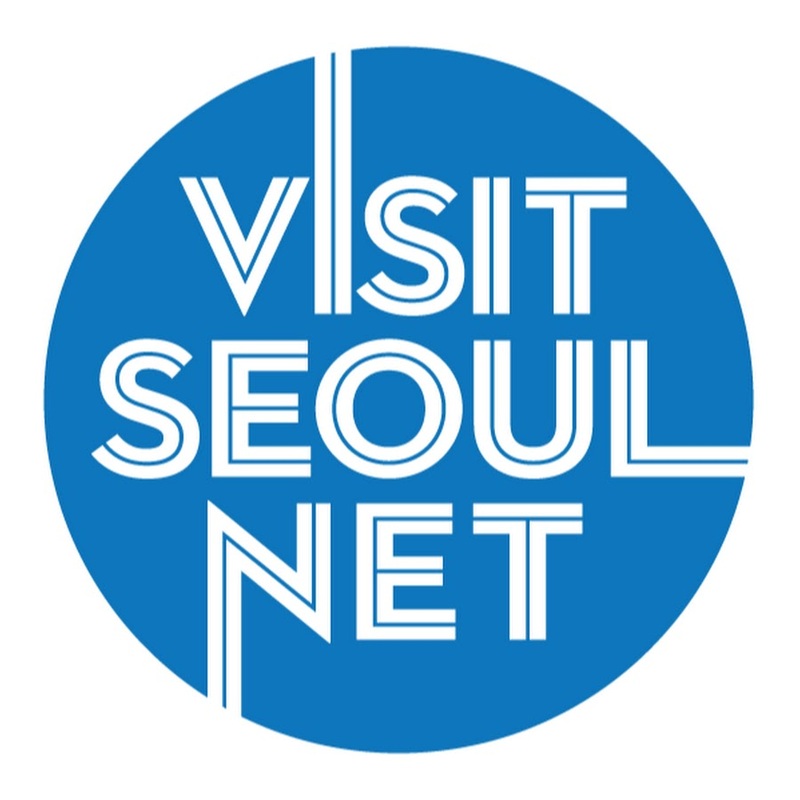 While his version may be a bigger scale of the norm, the "soju train" is totally a real thing in Korea and it's not uncommon to see young Seoulites trying to out-bomb one another on any given night of the week. Alcohol Etiquette: Because of Korea's Confucian roots, there are a number of rules dating back hundreds of years that still dictate drinking etiquette today. When Psy pours Snoop a shot, we can see him touching his chest with his left hand, signifying his respect for his drinking buddy. There are a few additional rules specific to soju: never pour your own, and don't refill your glass until it's empty. Love Shot: Koreans place a great deal of value on being in a relationship- their matching underwear proves it- so it's only natural for couples to show off their love when drinking. A "love shot," which is taken by locking arms and chugging simultaneously, is demonstrated by Psy and Snoop, no doubt to illustrate their budding bromance. Cha, Cha, Cha: Koreans tend to party in rounds, or cha, that usually begin at dinner and can end as late as breakfast, which was most likely the case for Snoopsy, considering the two only had 18 hours to film the video. Depending on the demographic, said rounds involve the consumption of plenty of alcohol and tend to be held at restaurants, billiard halls, the street (no open container law here! 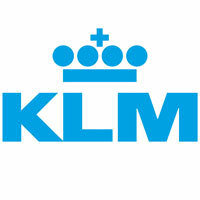 ), bars, dance clubs and karaoke rooms. Noraebang: Ah, yes, karaoke. Unlike in the West, karaoke bars, or noraebang, are divided into private rooms to allow for sloppy singing without fear of being judged by complete strangers and to lessen pangs of morning-after shame, which is still pretty much guaranteed. 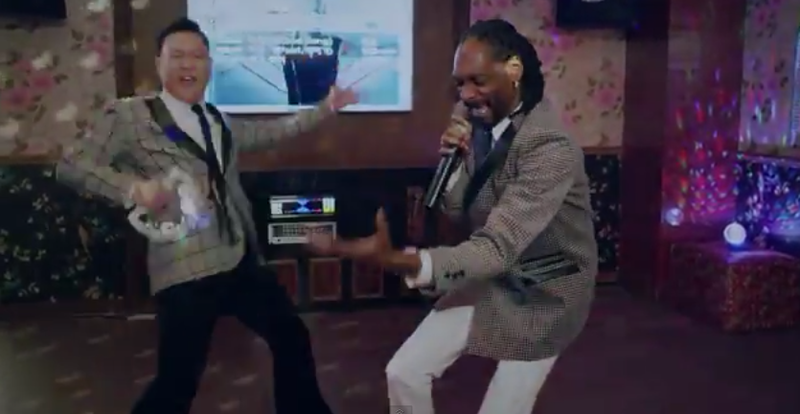 In the video, we watch Psy shake a tambourine, an obligatory karaoke prop, while Snoop raps on the mic. A cameo is made by G-Dragon, an uber-famous Korean rapper and fashion icon, and he mimics the performance style of trot singers popular in 1970s Korea. Hangover Drinks: By now, it's obvious that drinking plays an important role in Korean culture, from building business relationships to letting off steam after a long day at the office. So how do employed people function after weekday all-nighters? Hangover drinks, of course. Dawn 808, Condition Power and Morning Care are a few of the big brands of these medicinal beverages that are sold in just about every convenience store in the country. Psy is spotted in the video chugging one of these to relieve his hangover, though in actuality, they are meant to be consumed before drinking rather than after the damage has been done. 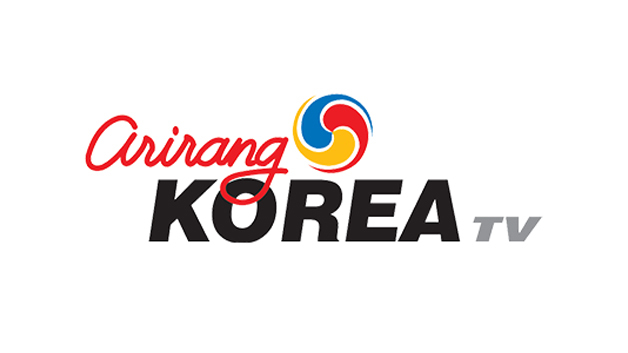 Morning-After Grub: While Americans tend to reach for greasy snacks to soak up residual alcohol, Koreans go for spicy soups, such as haejangguk ("soup to chase a hangover") and cup noodles, readily available at the corner mart. 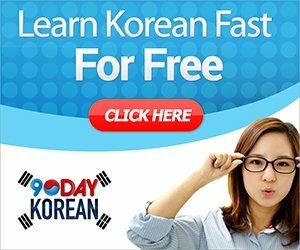 Jajangmyeon, or black bean noodles, is another popular choice, as it's the country's biggest delivery option, perfect for those who just can't quite get out of bed. Koreans also love eating this dish in billiard halls, just like Psy does in "Hangover." Sauna Soak: When Koreans party until the sun comes up, they sometimes crash in a jjimjilbang, or public sauna. These incredible institutions boast amenities such as steam rooms, hot tubs and shared sleeping quarters that are great for sweating out toxins left over from the night before. Unlike Psy does in the video, however, Koreans tend to soak rather than swim. Many can attest that an afternoon at the sauna is the perfect way to cure a hangover. That, or the whole hair of the dog thing, which the unlikely duo seems to prefer. Only time will tell if Psy and Snoop's collaboration will create a buzz with its high alcohol content and portrayal of Korean drinking culture, or will simply leave viewers hungover on horse dances. Whatever your opinion of Psy's "Hangover," it's safe to say that it ain't over, oppa. Words by Mimsie Ladner of Seoul Searching. 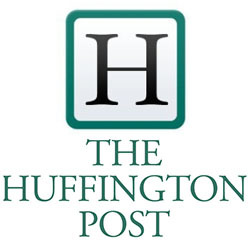 Content may not be reproduced unless otherwise authorized. Just as an FYI,the saying is "hair of the dog", not "horse of the dog". Thanks for this. I--from the U.S.--have mixed impressions of the song and video, but I have been rewatching it a lot. The cultural knowledge adds interest for me. 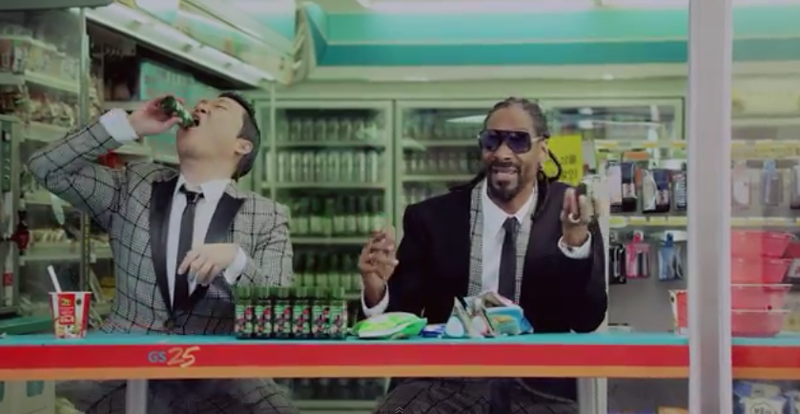 Are Psy and Snoop celebrating the lifestyle, satirizing it, or just having fun performing? Is there any significance to rolling the shot glass on their cheeks? The beauty about this place is that they give you a somewhat blank canvas where you can create the party you envisioned, etc., which will be different from others.